Zeiss has replaced its so-called “Classic” range of Nikon ZF.2 and Canon ZE SLR lenses with redesigned models reminiscent of the company’s high-end Otus range. Adopting the scientific name for a genus of birds of prey, the rebranded Milvus lens range consists of several models, with this particular 1.4/50 model featuring an all-new optical design as a replacement for the Planar T* 1,4/50. Announced in January 2014, the Sigma 50mm F1.4 DG HSM is a high-speed premium AF lens with an image circle designed to cover full-frame sensors. When fitted to an APS-C camera, however, the angle of view is equivalent to a 75mm short telephoto. 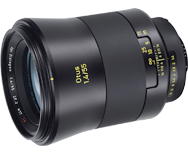 Designed exclusively for Sony E-mount cameras and the full-frame A7 series models in particular, the Zeiss Loxia 2/50 (50mm f/2), like the Otus ZF models, deliberately avoids AF in favor of a mix of manual mechanical controls and electronic data transfer. Read on to find out how well this lens performs.